Minister and Consul General Atsushi Kuwabara with the new scholars, and the officers, speakers, and members who spent time with them and wished them good luck. A record 67 MEXT scholars were given a pre-departure orientation at the JICC Hall in September. 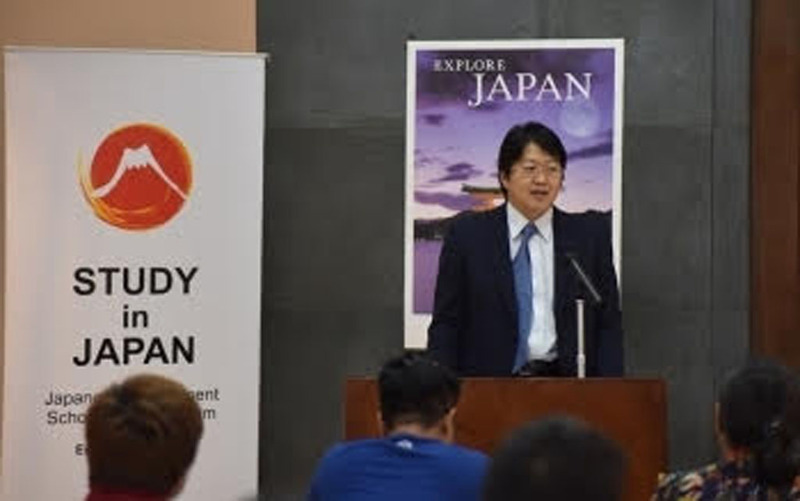 Minister and Consul General Atsushi Kuwabara congratulated the scholars, advised them to make the most out of the opportunities given to them, and expressed the hope that their work will contribute to the furthering of Japan-Philippines relations. Minister and Consul General Atsushi Kuwabara giving the opening remarks. 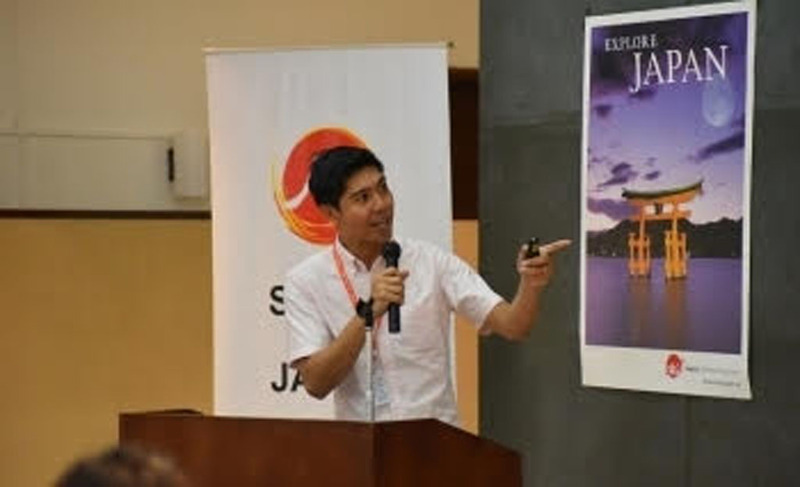 Mr. Sylvestre Amorsolo, the Senior High School Vice Principal of PAREF Southridge School, Muntinlupa City, shared of his experiences as a teacher trainee in Japan with a focus on the personal and cultural aspects. The numerous photos in his presentation captured the audience’s attention. So did the varied experiences he shared which included a performance of a Philippine folk dance he couldn’t back out from, his first time to try a public bath, and the traditional Japanese wedding photo session he and his wife, Sarah, also a teacher trainee, were treated to. Vice-Principal Mr. Sylvestre Amorsolo sharing aspects of his teacher trainee experience. Dr. Richelle Zafra, an Asso. Professor at UPLB’s College of Engineering, focused on giving advice to scholars, particularly researchers. 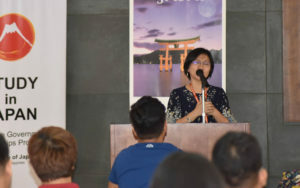 She urged the new scholars to prioritize and take their studies seriously even if their adviser appears to have a relaxed attitude and despite distractions that may include opportunities for part-time work. She said it is those who take it easy or lose their focus who fail to complete requirements or meet standards. 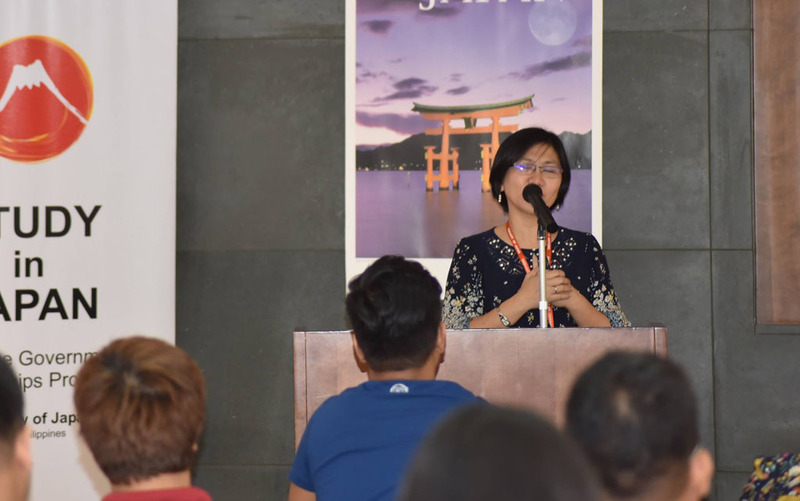 Dr. Richelle Zafra advised the new scholars to keep their focus on their studies and to be mindful of cultural differences. 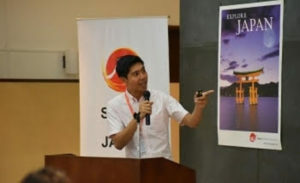 In addition, Dr. Zafra emphasized the importance of handing only well-wrapped gifts to Japanese because to them the wrapping indicates one’s sincerity. She also shared being scolded by a lab assistant for wasting his time because she once arrived late for an appointment. Please never be late she advised the new scholars. Thereafter Ms. Jenny Okada gave the scholars even more reminders that were equally important. Along with everything they heard, the students sure got plenty of things to think over and prepare for before their departure in October. 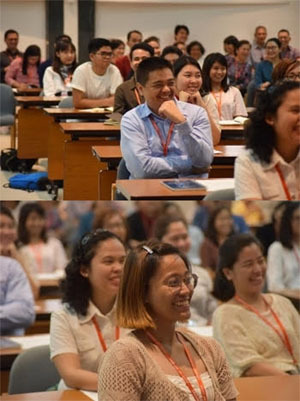 For our latest batch of scholars, the orientation was long but informative and interesting. Still warm buko pie and cold pineapple juice were served after the orientation’s conclusion–a filling end to over two hours of advice and reminders.